Ever since I moved to California as an 18 year old in ’99, I’ve been trying to make a video game. I remember spending my first Friday night in the Academy of Art dorm on Van Ness teaching myself C++ and trying to code up a little Scorched-Earth-ish projectile physics game, thinking ‘surely I can finish this up in a weekend or two, right?’. That, of course, didn’t happen. I got partway through before I learned enough to see that my design was completely brain-dead and needed to be rewritten. So I’d start over and get partway through. Then I’d learn more and start over again. And again. So here I am, 12 years later. I’ve long since finished school and have a job I love, but there’s still this nagging little itch to for once in my life finish one of these little game projects. And that’s where BombSquad comes in. 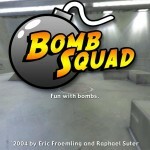 BombSquad is a game I started writing in 2004, right after graduating from the Academy, as a way to pass the time while applying for vfx jobs. 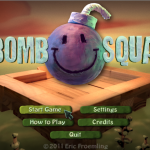 It started out as somewhat of a bomberman kinda game but has since morphed into something very different: a sort of smash-brothers-meets-myth-2-meets-wwf-royal-rumble party game. Anyway, it’s been sitting incomplete on the shelf collecting dust for years, unseen by anyone save some friends and relatives at the occasional family gathering back in Illinois, where its been a hit with my young cousins.